The problem: The need to label 1,000 to 6,000 round products per day. 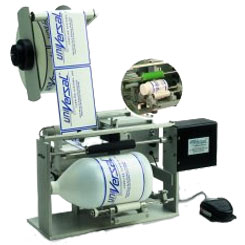 Exceed your quota with your R310 table top labeling system. This roll-on labeling system can label product sizes from ampoules to gallons with a quick and easy changeover. With a press of a foot switch, the labels are applied to round products quickly (10-20 products per minute) and accurately placed every time. Web width: up to 6.75"